Relative Clauses: "Who," "Which" & "That"
Let’s start off with a question. What is a tense shift? A tense shift is a form of a verb that indicates a change in time. For example, “I never eat watermelon seeds because I heard watermelons will grow in your stomach.” In this sentence, there are three tense shifts: present tense – eat, past tense – heard, and future tense – will grow. These tense shifts show the reader that the author is purposefully referring to different time periods. Although tense shifts can be helpful in indicating a change in time, they can also be confusing if not used properly. 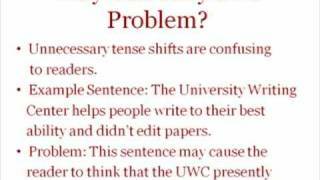 For example, “The University Writing Center helps people write to their best ability and didn’t edit papers.” In this sentence, there are two tense shifts: present tense – “helps” and past tense – “did not”. These tense shifts are confusing because it leaves the reader wondering, “Well, if the Writing Center did not edit papers, does it edit papers now?” Therefore, the tense shift in this sentence is unnecessary because it causes confusion. So, to wrap things up, keep your verbs in the same tense UNLESS you are specifically referring to different time periods.